How to Clean Wood Stove Glass - 5 Top Cleaning Tips! Struggling with those stains on that beautiful glass window? Today, we cover wood stove maintenance and explain some awesome techniques for cleaning the glass on wood stove doors. A wood burner is the center of any room. Not only does it look elegant, making it a talking point for anyone visiting your home, but there is nothing quite like that feeling of firing up your wood stove on a chilly winter’s night and snuggling up to watch the flames dance. Plus, you can feel better about heating your home using a renewable energy source, rather than just whittling away your cash on expensive electricity or gas bills. Saving the world and saving you money? A wood burner is an exceptional investment. Of course, even with something as wonderful as a wood stove, there is one slight issue. 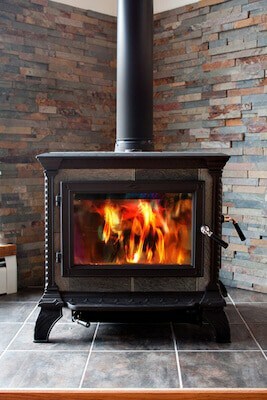 After a wonderful night enjoying the coziness it brings, the glass of your wood stove can get clogged up with soot and dirt. Which is far from appealing, especially when you want to show off your wood stove to family and friends. Wood stove cleaning is always easiest if you keep on top of it. By continuing to use your wood burner without cleaning the glass, you’ll soon find that the glass can become so sooty that you won’t see the flames at all. It’s usually at this point that simple elbow grease becomes too hard to shift the soot. If the soot is still minor, though, your first port of call should be a damp cloth. Warm glass is always easier to clean than cold, however, it is incredibly important that you let the glass cool enough before you attempt to clean it. If it’s cool enough to touch, then you can start. Otherwise, you might find yourself in the ER. 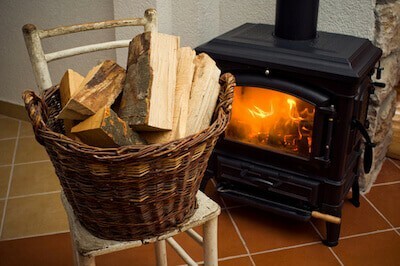 To use a cloth as a wood stove glass cleaner, simply soak it in lukewarm water with no detergent. Then take your cloth and rub the glass in circular motions. Remember to rinse your cloth often to get rid of the soot. 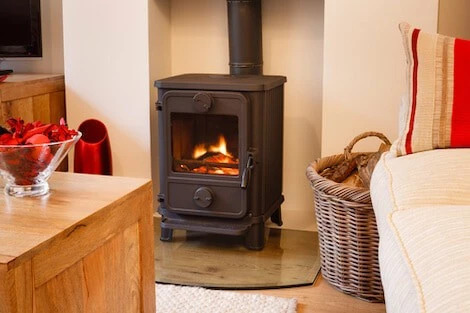 Recommended Reading: Don’t miss our huge guide to the top small wood stoves. When a damp cloth simply isn’t cutting it, this is when many of us can give up on our mission on how to clean fireplace glass doors. There is another effective way to get those doors shining, though, even if it seems a little peculiar at first. Ashes are often seen as an annoying byproduct of our wood burners, yet, many of us don’t release that ashes can be transformed into a very useful wood burning stove cleaner. When your ashes are cold, simply dip a piece of newspaper into a pile of them. Then, like the damp cloth, use this ash-laden newspaper in circular motions on the glass. This should loosen up the stubborn soot and allow you to wipe away any residual dirt with a damp cloth. Baking soda or bicarbonate of soda can often work cleaning miracles and, when it comes to your burner, it makes for an effective pellet stove glass cleaner. For best results, mix either your bicarbonate of soda or baking soda with a little water to form a thick paste. This paste can then be applied to the glass. For tough stains, you might want to leave this paste to work its magic for 10-15 minutes. Then either use a damp cloth or newspaper to, again, use circular motions to loosen the soot. Once the worst is off, use a clean cloth to wipe away and leave sparkling glass. Keep in mind, though, when using baking soda or bicarbonate of soda, you’re going to have to commit to a lot of rinsing. This concoction is wonderful for removing stains, but it can leave a white residue that can be tough to get rid of. Our latest article is all about stove maintenance and cleaning. We review the top hot ash vacuum cleaners that make stove cleaning a breeze. Another cleaning superstar that we already have lying around our kitchen cupboards – vinegar is a simple remedy for sooty fireplace doors. Unlike baking soda, you don’t need to make a paste or anything here. Just take your cloth or piece of newspaper, dip it into the vinegar and use your tried and tested circular hand motions to remove the dirt. Your main advantage here is that vinegar won’t leave that pesky white residue. So, all you have to do is use a clean cloth to wipe away any excess, leaving you with sparkling wood stove glass. Recommended Article: Get your stove running more efficiently than ever with a non-electric stovetop fan. Sometimes, though, you need to bring in the big guns in order to get your wood stove glass back to gleaming – especially if you’ve let the soot and dirt build-up! As the burnt-on residue can feel impossible to shift. Luckily, there is an answer. There are plenty of dedicated wood stove glass cleaner products on the market. Not only are these tough on stains, but commercial products are undeniably convenient. Many come in a handy spray bottle, where you simply spray it on your fireplace doors and wipe away with a damp cloth. If you do use a stove glass cleaner, be sure to follow the instructions given to you by the manufacturer. Also, make sure that you clean away any of the chemical residue left on your stove. The last thing you want is for your room to be filled with disgusting chemical fuels the next time you light your stove. Make sure you use a dedicated product for your wood stove cleaning too. Many abrasive cleaners, that might seem appealing for removing tough stains, can actually scratch and damage the glass on your wood burner. Never use a razor blade either, many online tips might point towards a razor blade as the perfect solution, however, when used incorrectly, you’re not only in danger of damaging the glass of your wood stove, but you’re also in danger of hurting yourself. It’s simply not worth the risk. Follow us on social media to see more tips like this on a daily basis. We’d love to know if you have any tips of your own that you wouldn’t mind sharing with our readers. Just leave a comment down below.